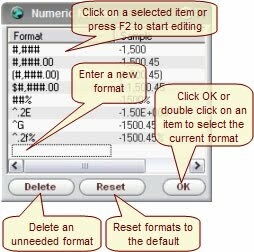 The Numeric formats dialog allows you to create and edit formats to be used to display numeric values. #,### - use a comma to separate every three digits. #,###.00 or #,###.## - use a comma to separate every three digits and the number has a period and two numbers afterwards. E - identical to the e format except that E rather than e introduces the exponent. f - a signed value having the form [ – ]####.####, where #### is one or more decimal digits. The number of digits before the decimal point depends on the magnitude of the number and the number of digits after the decimal point depends on the requested precision. g - a signed value printed in fe or format, whichever is more compact for the given value and precision. The e format is used only when the exponent of the value is less than –4 or greater than or equal to the precision argument. Trailing zeros are truncated and the decimal point appears only if one or more digits follow it. G - identical to the g format, except that E, rather than e, introduces the exponent (where appropriate). Any decorative symbols like $, %, etc. can be prepended or appended to the numeric format: $#,###.00; $^.2f; ##%, etc. Click on an already selected format or press F2 to begin editing an existing format. A sample on the right will give you immediate feedback while you are typing in the format. Double click on any item in the list or select an item and click "OK" to assign a numeric format to the object whose property you are currently editing. All changes you make to the formats are stored. Click the "Reset" button to restore to the default list.